Suncast's Side tracker<sup></sup> hose reel provides convenient, wall mounted storage for your garden hose. Sturdy resin construction makes it durable and easy to maintain. Leader hose included. 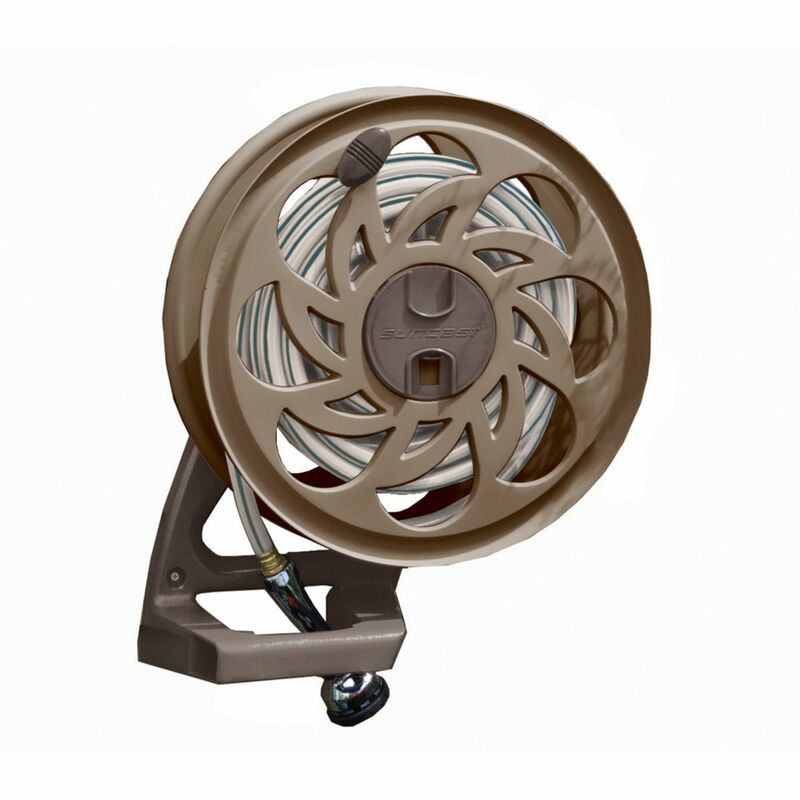 Side Tracker Hose Reel with 125 ft. Capacity Suncast's Side tracker<sup></sup> hose reel provides convenient, wall mounted storage for your garden hose. Sturdy resin construction makes it durable and easy to maintain. Leader hose included. Side Tracker Hose Reel with 125 ft. Capacity is rated 1.8 out of 5 by 5. Rated 1 out of 5 by JRad from Falls off and leaks The reel won’t stay on the mounting bracket and falls off. The clip that holds it on is poorly designed. After a couple months of owning this and only using it a couple times it not longer works. I can’t even get it back on now. I installed mine in the garage so weather is not even an issue. Rated 5 out of 5 by Lou10 from Does the job One thing to remember is to release the water pressure before winding your hose on the reel. Rated 1 out of 5 by Hosed from Leaks!! Looked solid and mounted well to my wall. Then realized the hose attachment leaked. Un-mounted and tried various fixes....no good. Ultimately, the cheap plastic hose thread is, well, cheap. You will not get a good hose connection and water will spray everywhere! Don't buy! Rated 1 out of 5 by Cacho from Flimsy bracket, leaky connectors It leaked easily from the first day, it was impossible to fix it. Then just 2 or 3 years later the mounting bracket broke off completely, even when installed inside the garage, not outdoors. Very flimsy construction overall. Rated 1 out of 5 by Dolllly from Leaked from day 1 Bought this to replace a 6 year old reel that was great for years. From the moment i installed it, it leaked. I tried 4 different hoses thinking it was the hose until i finally gave up. I even went out and bought a new hose... Yes it still leaked. Awkward to put the hose attachment in and cheap connections. I do not recommend this, im returning mine!! the only good thing about it was that it had a smooth reel.